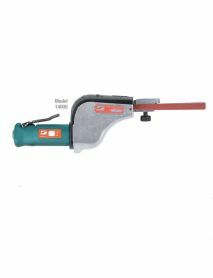 Dynabrade 15013 Mini-Dynafile® II Abrasive Belt Tool available from BND Abrasives Ltd! Please call for special prices and availability. Discount available for distributor / resellers! Call 01264354133. 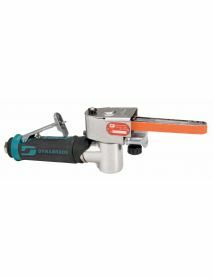 Ideal for strap polishing and working in narrow openings. 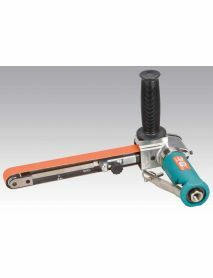 Tool includes 15035 Contact Arm for 1/2" (13 mm) wide x 13" (330) long abrasive belts and 11078 Drive Wheel. 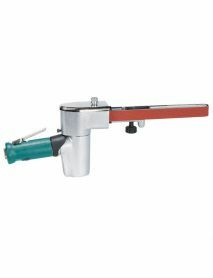 Lightweight ergonomic design handle features 7 degree offset. 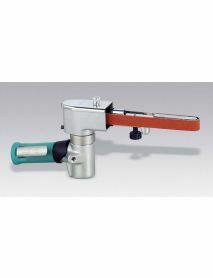 Multi-position grinding head pivots 360 Degree. 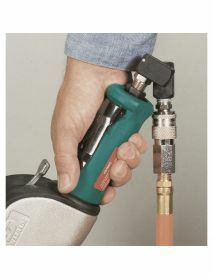 Tool has standard rear muffling with additional exhaust directed at the front belt assembly, providing the benefit of belt cleaning and cooling. 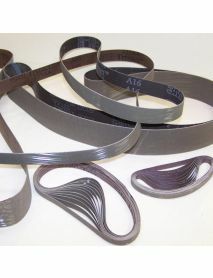 Swiveling belt guard, just pull up on cover and swing out of the way for quick and easy belt exchange. Pivot screw does not need to be loosened to move guard.